Finding Kat Heckenbach: Beetle What? 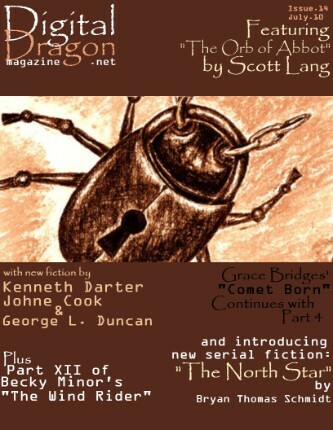 My artwork made the cover of Digital Dragon Magazine! Woot! Hop on over and give 'em a read--there are always great stories in this magazine (hence my excitement over making their cover!). Seriously, now. If ya read the story I posted about last time, ya know what's good for ya ;). Digital Dragon Magazine--CLICK. Yeah!!! Awesome. This is so exciting, Kat. Horray for you, Kat! Yay! Very nice picture too. I have never heard of that magazine before.